It was 5:00 pm when I decided to escape my home for a place the power-cut hadn’t reached on June 18. Badia, the restaurant closest to the International Committee of the Red Cross (ICRC), is always my first option. Whenever I need to leave the sit-in tent to work on my laptop, I get there after walking less than five minutes. I was drowning in stress from my final exams. I had to double my efforts studying, as I had spent more of the last semester worrying about hunger-striking Palestinian political prisoners than my classes. Even with stress from being unprepared for any exam, it was difficult to concentrate. My thoughts were filled with the revolution of empty stomachs inside the Israeli jails. June 18 marked the 90th day of the hunger strike Palestinian footballer Mahmoud Sarsak had launched against his unjustified three-year detention under Israel’s Unlawful Combatants Law. His hunger for freedom had pushed his life to the edge of death. I lost track of time while alternating between news Web sites and literary ones for my class. Dad called me, reminding me to return home early. Just before I closed my laptop, I refreshed my Twitter page to see a Tweet saying, “Israel to Release Mahmoud Sarsak on July 10.” I quickly collected my things and ran toward the ICRC, so excited I even forgot to pay my bill. Even the smell of the air seemed different when I stepped outside. Freedom filled the atmosphere. The chants I heard from the ICRC at Badia’s entrance made me run. The first person I recognized at the sit-in tent was the heroine Hana’ Shalabi, the ex-detainee who hunger-struck for 43 days to win her freedom, under the condition of expulsion to the Gaza Strip for three years. I ran to her and she hugged me happily, saying, “Congratulations on Mahmoud’s freedom!” Everyone was raising victory signs and singing for freedom. Then a man with a huge tray of sweets arrived and started distributing them. I arrived home very late to find Dad waiting in the dark garden, looking upset. I didn’t want anyone to spoil my happiness, so I walked toward him chanting happily, “We defeated the jailers!” I was sure he hadn’t heard about Mahmoud, as our power was still cut. “Mahmoud will be free on July 10,” I said while looking at Dad, whose face turned into a smile. “People are still celebrating at the ICRC. Hana’ Shalabi was even there.” I was smart enough to find a way to negate his anger. 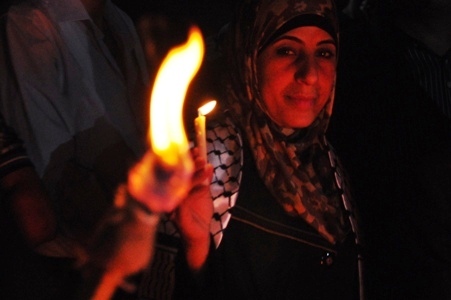 People in Gaza waited eagerly for July 10, a day that will be commemorated in the history of Palestine. All Palestinian television and radio channels reported this magnificent event. Thousands of people welcomed Mahmoud by the Erez crossing, the same place he was arrested around three years ago. As the ambulance arrived at the Gaza Strip side of Erez, Mahmoud appeared in its window, holding a football with one hand and waving with the other to the crowd of people excitedly waiting to see him. Despite hating long drives, last Friday, I was crazy enough to tolerate a one-hour trip to visit Mahmoud’s house in Rafah, knowing he might not even be home. A group of foreign activists joined me in my adventure. “And what if he isn’t there?” my friend Fidaa, a Palestinian-American human rights activist, asked. “We’ll wait for him to come back!” I answered immediately. We arrived at Star Square, near where the star Mahmoud lives. Thanks to posters and graffiti spread all over the walls of the Rafah refugee camp’s alleys, it was easy to find his house. “The groom just left for Gaza City,” his neighbors told us, but we were still excited to be at the house where “the groom” grew up and to meet his parents, who raised him to be a revolutionary. Mahmoud’s parents were very friendly and welcoming. His house was small and simple, yet full of warmth and joy. It was crowded with neighbors, relatives, and strangers who, like us, had travelled the Gaza Strip to meet Mahmoud. Many of us had no relation to him, but following his struggle since the early days of his hunger strike made us feel connected to him. Mahmoud Sarsak, a Palestinian hero, has become a symbol of our resistance. The house grew increasingly crowded with visitors. So we left to give others the opportunity to talk with Mahmoud’s wonderful mother. But I couldn’t give up on meeting Mahmoud himself so easily. We had already travelled from the northernpost point to the southern tip of the Gaza Strip looking for him! So I called his brother Emad, whom I had met frequently in the sit-in tent. When he picked up the phone, I told him I had just visited his family with a group of friends, and that we were very happy to meet his parents. He appreciated our visit, and suggested we meet them in a Gaza restaurant. Excited, we accepted his offer. We arrived at the restaurant by sunset. My heartbeats grew faster as the time for our meeting drew closer. I could see Emad waiting for us by the entrance. He welcomed our group inside and introduced us to Mahmoud, who nicely asked us to join his table. I felt very nervous sitting directly across from him, but proud that I could look him in the eye while speaking to him. He wore two gold medals and a scarf combining the Palestinian flag and keffiyeh. 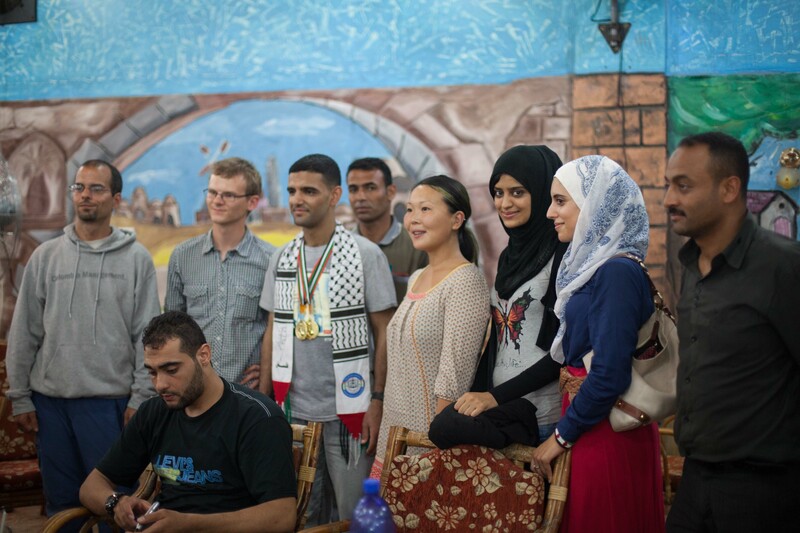 That’s when we finally made it and met with Mahmoud Sarsak at a restaurant in Gaza City. His humbleness added a lot to his charm. He kept repeating that he wouldn’t have achieved his victory without the popular and international solidarity he received. “It’s not my victory, it’s yours. I gained my strength and poise from you.” It was obvious that he had lost a lot of weight, but he was still healthy. Joe Catron, an American activist who has met many freed prisoners, said later that he had never seen a recent hunger striker in such good shape. “Resistance isn’t only about armed struggle,” he said. “Resistance can be through pen, brush, voice, and sport. We are all freedom fighters, but each of us has his or her own weapon.” His eloquent, passionate answer impressed us even more than we already were. The time grew late, and we had to end our amazing conversation. Mahmoud Sarsak is one of the most inspiring people I have ever met. I will remember every word he said as long as I live. According to him, we all contributed to his victory. Let’s unite to achieve more victories for Akram Rikhawi, Hassan Al-Safadi, and Sammer Al-Barq. Make them reasons for your life, and fight injustice any way you can.